Breathing problems in children, become one of the biggest concern these days. According to the World Health Organization(WHO), nearly 2.6 million children are dying every year worldwide due to respiratory infections. Asthma is one of the breathing disorder and the most common chronic(Long-term) diseases found in childhood. It may develop at any age and most commonly begins in childhood, most probably within the five years of age. Sometimes the problem may be resolved in some children with certain medications preferred by doctors. Unfortunately, in some children, childhood asthma can't be cured and continues to the adult years. Asthma is a lung disease or inflammation of lungs that makes your child airways sensitive and weak. When these airways are exposed to triggers, they produce thick more thick mucus than usual. The lining around the airways also swell, and muscles will become tight, and finally, this makes the airways of your child narrow that makes difficult for air to go in and out of the lungs which lead to asthma. How To Recognize Asthma In Children? Diagnosing children with asthma can be difficult. In most of the cases, it doesn't show any symptoms for a long period until your child has an asthma attack. People usually get confused with the symptoms, because the symptoms of asthma are similar to other respiratory diseases. It will also become difficult for children with certain age to explain his or her symptoms to their parents. However, the following symptoms in children might be signs of asthma in your child. Signs and symptoms of Asthma vary from child to child; it may get worse over time. Sometimes your child may suffer from only one sign or symptom. It is difficult to find the symptoms of asthma as they are similar to other respiratory problems. So consult a doctor immediately if you see any of the above symptoms in your child. Genetic Problems: If any person in the family has asthma, then the next generation people are more likely to develop it. Infections: Viral infections of the nose and throat can cause asthma at times. Some other infections like pneumonia or sinus infections can also lead to asthma. Allergens: Allergies due to allergens can also cause asthma symptoms. Allergens like house dust mites, animal dander, cockroaches, pollens etc, can trigger asthma. Environmental Factors: Irritants in the air you breathe outside or indoor can trigger asthma, such as cigarette and other smoke, air pollution, cold or dry air, certain odours and fragrances, volatile organic compounds in sprays, and cleaning products. Experts are working to prevent a child from developing asthma with a family history of asthma. It is evident that if a pregnant woman smokes, the children born are more likely to have asthma. A pregnant woman should not smoke. On the other hand, there were many things you need to avoid to prevent asthma symptoms or flaring up the symptoms in children who have asthma. Tobacco smoking often worsens symptoms of asthma in children, so avoid smoking in areas where the child spends time. Exercise is essential for a child's growth; usually, doctors encourage children to maintain physical activities, practice, and sports participation and they also recommend using an asthma drug immediately before exercising if needed. Doctors might suggest inhalers to get temporary relief from the symptoms. Immunotherapy(Allergy shots): Sometimes particular allergens can't be avoided, so doctors prefer some allergy shots to desensitize the allergen. Allergy shots are given only after a keen diagnosis to relive from allergic asthma. Allergy shots are more effective in children when compared to adults. Initially, a small dose of allergens are used, the allergen injected is increased each time slightly. After 5 to 6 months of weekly shots, the dose will contain an optimal amount of allergen which is called as a maintenance dose. If the allergen injected causes any severe allergic reaction then doctors will stop giving the shots. If symptoms of allergic asthma are relieved, then shots should be continued for some more years as recommended by the doctor. Experts are working to find a cure for childhood asthma. But with the right treatment at right time the symptoms and prevent damage to growing lungs. If your child has asthma, don’t let the fear of an asthma attack hold you back! 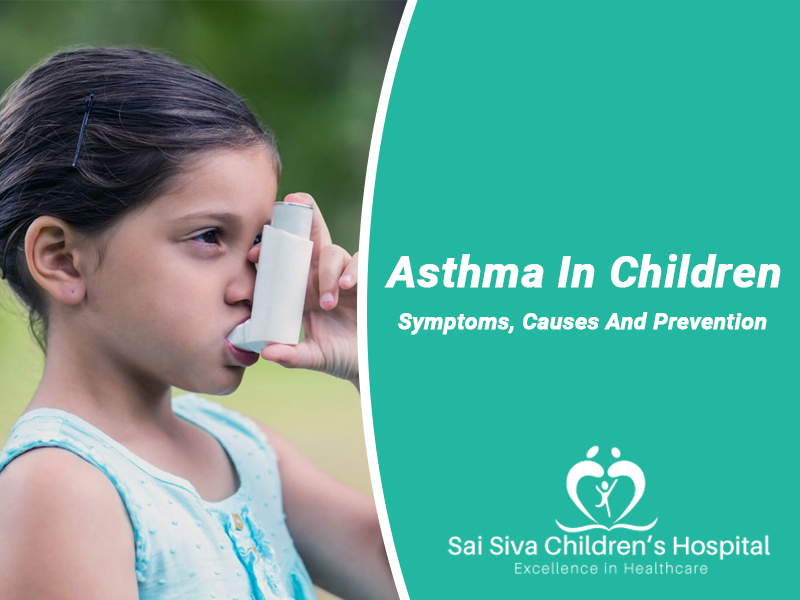 Our doctors(allergist) at Sai Siva Children's Hospital can identify the triggers, and help your child to avoid and manage them.